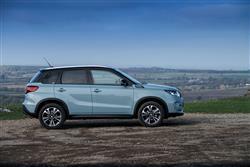 Suzuki's improved Vitara continues to offer a strong option in the small SUV segment and is now based around Boosterjet turbo petrol power. Jonathan Crouch reports. 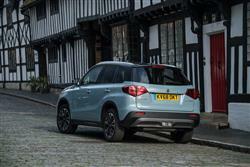 The Vitara, Suzuki's compact crossover, looks to build a lot of talent into four metres. This model line's now thirty years old and these days is built around 1.0 and 1.4-litre petrol power, with the usual option of ALLGRIP 4WD. This revised model gets sharper styling, extra safety kit and remains competitive proposition in the small SUV segment. Small SUV-style 'Juke-genre' SUV models are all the rage just at present. Every mainstream brand, it seems, must have one. 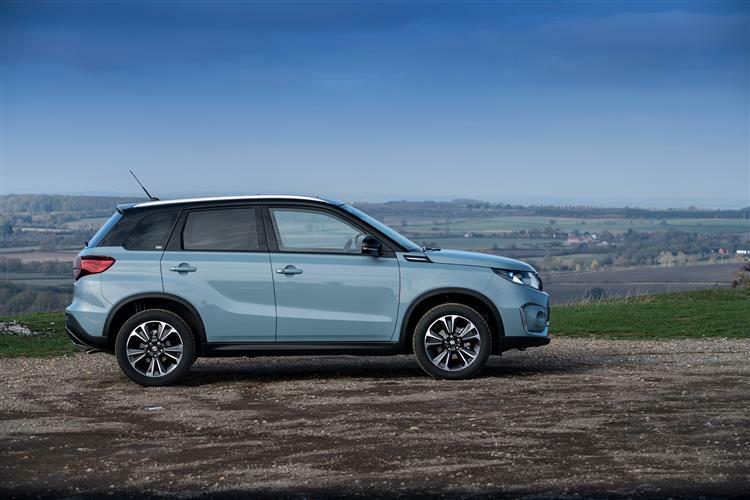 Here's Suzuki's offering for customers in this sector, the surprisingly light, lithe and fashionable Vitara. The Vitara is the kind of youthful, dynamic-looking product that buyers of compact Crossover models seem to want. On paper, it certainly seems to tick all the 'Juke-genre' boxes, with lifestyle looks, trendy cabin technology and supermini-standards of efficiency. It even claims to be a rewarding steer on twisty tarmac, especially with the 1.0 and 1.4-litre BOOSTERJET 1.4-litre petrol turbo engines that the Japanese brand has added since this car was originally launched. That really would make it different from small Suzuki SUVs of the past. There are familiar touches though: value pricing, high specifications and a 4WD option - something actually relatively unusual in this segment. It all sounds quite promising. 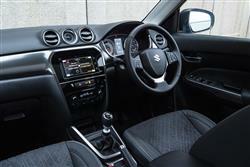 The range is now based around 1.0-litre and 1.4-litre versions of Suzuki's well-proven Boosterjet petrol engine. There's now no diesel option. We'd try and stretch to the 1.4, which puts out 140PS and 220Nm of torque is available from just 1,500rpm through to 4,000rpm. This is one of Suzuki's newest units and gives this car a reasonable turn of speed, enabling it to make 62mph in 10.2s en route to 124mph. The short overhangs will help with off-roading but the 185mm ground clearance isn't that generous. The 1.0-litre Boosterjet engine puts out 111PS and offers 160Nm of torque. The ALLGRIP four-wheel-drive system is available with both units. The set-up features an electronically controlled clutch pack, controlled by a four-position switch on the centre console. Choose 'Auto' and it'll stick to driving the front wheels unless slip is detected, whereupon the rear wheels are pressed into action. 'Sport' diverts up to 20 per cent of torque to the rear wheels to give livelier handling. 'Snow' offers permanent four-wheel drive with the system choosing how much torque to split front and rear, while 'Lock' splits the torque equally between front and rear. With tight proportions and a front end that has more than a hint of current Land Rover design about it, the Vitara is quite an assured piece of design work. This improved version gets a sleeker front grille and lower bumper, plus the rear of the car features revised design and distinctive LED combination lamps. There are smarter alloy wheel designs too. As before, there's also a blacked-out floating glasshouse and heavily sculpted flanks. Buyers can also specify a rugged package which adds front and rear skidplates as well as additional body side mouldings. Suzuki cabins used to be the marque's weak link but this Vitara shows the company pulling its socks up a bit. 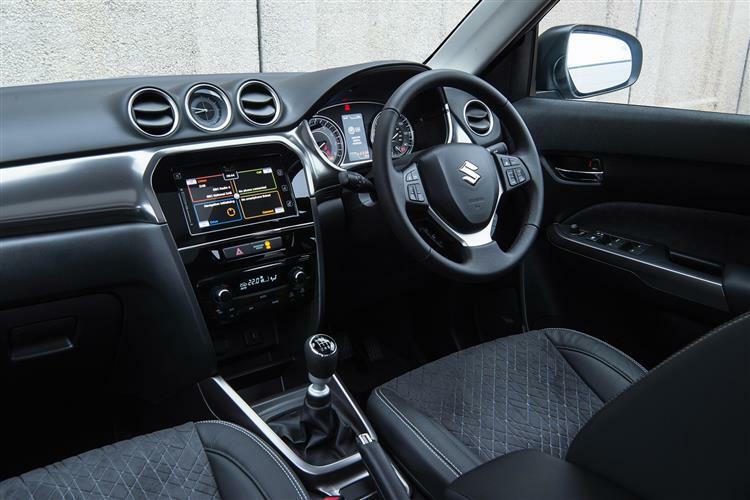 Okay, so the idea of body-coloured metal across the dash isn't a new one (a few of you will recall the Fiat Coupe mining that trend way back in '93) but Suzuki also offers chrome around the gearlever and door trims, plus an analogue clock. This revised model gets a smarter upper instrument panel incorporating soft touch material, while the instrument cluster has a fresh design and features a colour central information display. As ever, this is by no means a large vehicle, breaking the tape at just over four metres long, but it still features a features a 375-litre boot. That's competitive with the rival Renault Captur, although the Suzuki lacks the Renault's sliding rear bench seats. As before, prices sit mainly in the £17,000 to £26,000 bracket and buyers choose between 'SZ4', 'SZ-T' and 'SZ5' trim grades. You'll need a budget of well over £20,000 for the ALLGRIP 4WD version. All variants get seven airbags, 16-inch alloy wheels, a DAB Radio with USB and Bluetooth connectivity, cruise control with a speed limiter, auto air conditioning, front and rear electric windows and projector headlamps. The plusher SZ-T trim level adds 17-inch silver painted alloy wheels, rear privacy glass, Smartphone link audio and a navigation system. There's a range of personalisation options and lots of safety technology. This includes Dual Sensor Brake Support, Lane Departure Warning and Prevention, Traffic Sign recognition, Blind Spot Monitor and Rear cross traffic alert. The Vitara's CO2 emissions are low thanks to the use of high tensile steel and other weight saving measures in the body plus an Engine Auto Stop Start system which shuts down the engine when stationary. Go for the 1.4-litre Boosterjet manual with ALLGRIP 4WD and the combined fuel return is 52.3mpg with a CO2 reading of 127g/km. Choose the same car with auto transmission and you're looking at 51.4mpg and 128g/km. Residual values might well stack up better than the industry average if the current crop of Suzuki models is anything to go by. Strong reliability records and modest optional equipment lists have helped to keep 'real world' residuals buoyant. 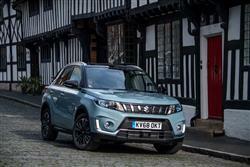 The Vitara shouldn't divert too far from that template even if it does promise additional personalisation options. Customers wanting a small Crossover of this kind now have so much choice that for many of them, it must be difficult to know where to start. If that's the case for you, then beginning your search by looking at a great all-rounder in this segment seems to make a lot of sense. And this improved Vitara is certainly that. In this test, we've looked at some of the reasons why. Take, for example, the extra space you get inside compared to key competitors like Nissan's Juke. And the high standards of specification that'll sugar the showroom proposition. Plus for what it's worth, this Vitara is also a bit more capable in poor conditions than most of the alternative choices you could make, provided you can stretch up to one of the pricey ALLGRIP 4x4 models. This is, in other words, in every sense, a Vitara for the modern world. A car that's a little more than just a fashion statement.